Romance and mystery surround the name of Caruthers more than fame and history do. 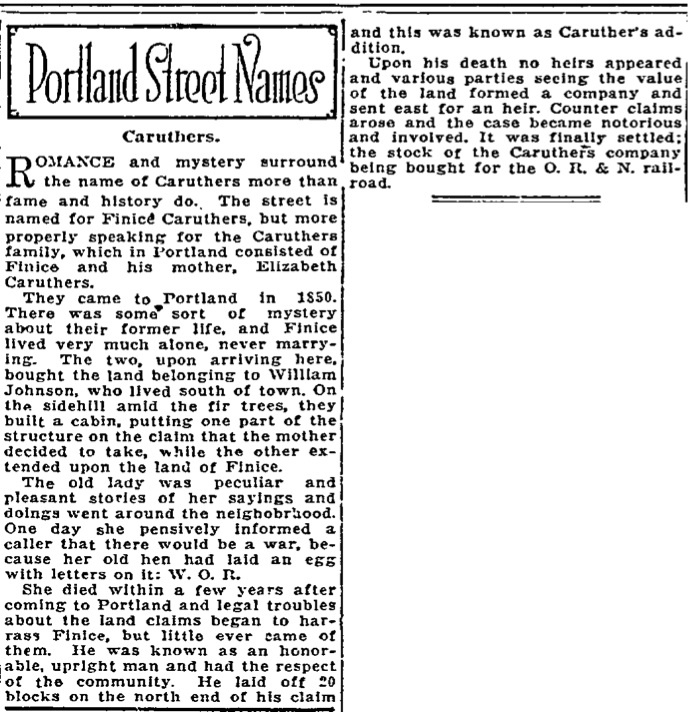 The street is named for Finice Caruthers, but more properly speaking for the Caruthers family, which in Portland consisted of Finice and his mother, Elizabeth Caruthers. They came to Portland in 1850. There was some sort of mystery about their former life, and Finice lived very much alone, never marrying. The two, upon arriving here, bought the land belonging to William Johnson, who lived south of town. On the sidehill amid the fir trees, they built a cabin, putting one part of the structure on the claim that the mother decided to take, while the other extended upon the land of Finice. The old lady was peculiar and pleasant stories of her sayings and doings went around the neighborhood. One day she pensively informed a caller that there would be a war, because her old hen had laid and egg with letters on it: W. O. R.
She died within a few years after coming to Portland and legal troubles about the land claim began to harass Finice, but little ever came of them. He was known as an honorable, upright man and had the respect of the community. He laid of 20 blocks on the north end of his claim and this was known as Caruthers addition. Upon his death no heirs appeared and the various parties seeing the value of the land formed a company sent east for an heir. Counter claims arose and the case became notorious and involved. It was finally settled; the stock of the Caruthers company being bought for the O. R. & N. railroad. Finice Caruthers was business partners with Stephen Coffin, establishing the City of Portland’s first public water supply. This was created by piping water (via log pipes,) from Caruthers Creek to the damned up Balch Creek. The court case involving the Caruthers land claim eventually ended up in the Supreme Court in the 1868 case of D. P. Thompson v. Andrew Woolf. It established that women have the same property rights as men.